This should be overloaded to return a description of the Transformer. Base (abstract) class for a jet transformer. 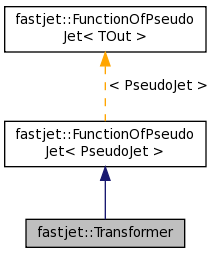 A transformer, when it acts on a jet, returns a modified version of that jet, one that may have a different momentum and/or different internal structure. See the description of the Filter class for a more detailed usage example. See the FastJet manual to find out how to implement new transformers. Definition at line 71 of file Transformer.hh. the result of the Transformer acting on the PseudoJet. Implemented in fastjet::Subtractor, fastjet::CASubJetTagger, fastjet::Filter, fastjet::Pruner, fastjet::JHTopTagger, fastjet::RestFrameNSubjettinessTagger, and fastjet::MassDropTagger.